Use both hands and the responsive 10-point touch capability to quickly and smoothly navigate across the edge-to-edge glass of your P2314T. The ergonomic stand offers optimal application and game control, as well as viewing comfort.VGA, USB, DP and HDMI ports plus MHL connectivity allows direct display of smartphone/tablet content on the touch monitor while charging your mobile device at the same time. 13.7" x 22.4" x 1.7"
A boldly reimagined touch experience. Superb picture quality with natural and intuitive touch, myriad connectivity options and guarantees to back them up. Engaging touch experience: Use both hands and the responsive 10-point touch capability to quickly and smoothly navigate across the edge-to-edge glass of your P2314T. The ergonomic stand offers optimal application and game control, as well as viewing comfort. Outstanding connectivity: VGA, USB, DP and HDMI ports plus MHL connectivity allows direct display of smartphone/tablet content on the touch monitor while charging your mobile device at the same time. Peace of mind: Your P2314T is backed by Dell's zero bright dot pixel policy with Premium Panel Guarantee and 3-Year Advanced Exchange Service for fast problem diagnoses and product replacement. 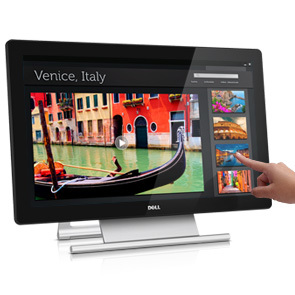 Work smart and keep your content at your fingertips with your DellTM touch monitor. Enjoy two-handed control with an enhanced touch experience that recognizes 10 touch-points at once, enabling fast, efficient application and game control across the smooth, edge-to-edge glass. Screen quality comes to life with the amazing clarity and pin-sharp details of Full HD 1920 x 1080 resolution; the excellent picture quality, with deep blacks and bright whites, from an 8 million:1 dynamic contrast ratio; clean, fluid motion from a fast 8ms (gray-to-gray) response time; and up to 270 cd/m2 brightness. Boost collaboration and usability with the ultra-wide 178°/178° viewing angle while gaining optimal application and game control as well as viewing comfort with the adjustable stand. Transform your smartphone and tablet devices into glorious, widescreen colour while charging them at the same time through the MHL port when you display your smartphone/tablet content directly on the P2314T touch monitor. Plus, the integrated VGA, USB, DP and HDMI ports enable efficient connectivity to a whole range of peripheral devices. Explore optional VESA-compatible mounting choices, including the Dell Single Monitor Arm (MSA14) or a wall-mounting kit (both options sold separately), for enhanced viewing flexibility. Ideal for work and play, your P2314T is designed for entertainment and browsing the internet on your XPS systemat home, or for multimedia applications and team projects at the office on such Dell systems as Latitude or OptiPlex as well as handheld mobile devices. For instance, connect your smartphone or tablet to the monitor through the MHL port so the rest of your workgroup can gather together to see the latest app you've created on a big 23-inch screen with an ultra-wide viewing angle. If you need a widescreen touch monitor that is designed to last, the Dell 23 Monitor | P2314T offers you a 23-inch viewable image with efficient performance and long-term reliability. With 17W normal-operation power consumption (typical) and less than 0.5W in active-off mode, the P2314T can help keep energy costs down. In addition, the PowerNap feature enables you to either dim the monitor to the minimum brightness level or put it into sleep mode when it is not in use. Dell P2314T - LED monitor - Full HD (1080p) - 23"